Does Flex Seal Work on Concrete? How Long Does it Take for Flex Seal to Dry? What Will Flex Seal Adhere To? How Much Pressure Will It Withstand? How to Use Flex Seal? 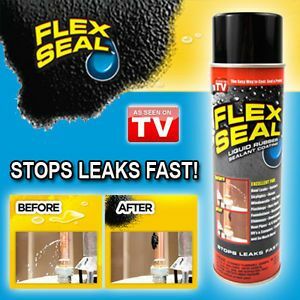 Flex seal is a liquid rubber that comes in an aerosol spray can or gallon container which expels the liquid rubber to fix holes, cracks to seal out water or keep in the air simply by spraying, pouring, brushing or rolling the liquid rubber on with the roller. It doesn’t sag or cause dripping during the hot summer months, and it’s non-toxic. The rubber will stay pliable and flexible for many years. We’ve written out a review of pros and cons to help you make the right choice. Prevents rust and corrosion. Mildew and chemical resistant Prevents rust and corrosion. Mildew and chemical resistant Doesn’t shrink or crack vs traditional caulking Quickly seal cracks, gutters and other small leaks fast Instantly stop leaky pipes, hose leaks. Liquid rubber in a can will stop leaks fast. It will protect your surfaces from corrosion, and you can use it on dry or wet surfaces. It will not peel or crack from the harsh winter seasons. It is incredibly versatile as it begins as a thick liquid that you’re able to roll, dip, brush, or pour on surfaces and then it magically turns into a sturdy, flexible rubber. Here are some pros and cons. 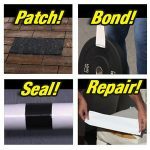 Q – Can the flex seal fix asphalt cracks? Q – What nap works best when using a roller to apply the liquid rubber? A – It will depend on the thickness that you’re looking to achieve, as a ¾ inch nap will deliver a beautiful thick coat. Q – Can this product be used to seal in a canvas awning? Q – What is the consistency of the liquid? A – I would say it’s like a thicker paint. Q – What colors are there available? A – White, clear, and black. Here is the most common used liquid rubber sealant coating that comes in an aerosol spray can. The convenient aerosol spray allows for easy sealant applications without the need of brushes and rollers. Highly durable to seal leaks and cracks for waterproof and without sun dripping damage for many years. Here are some pros and cons. Q – Will it hold fabric material together like a ripped car cover? A – Test it out on an inconspicuous part to see if it holds and if it does make certain that the fabric doesn’t move while the liquid rubber is drying. Q – Can this be used to coat PVC? A – Yes it can! Q – Can we use it on a propane gas pipeline? A – NO. It is not recommended. Q – What colors are available? A – Clear, white, and black. Q – Can I use this to seal copper water pipes. Q – Can I use it on a bike tire? A – Due to the intense pressure from a bike tire, it is not recommended. 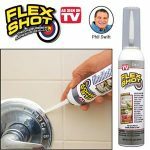 Flex shot is the perfect solution for tight spaces – This is portability at its finest when you need to caulk around your bathtub floorboards etc. It’s really easy to use and will stop flowing the minute you release downward pressure on the bottle. Here are some pros and cons. Q – Will it come with an extension tube? A – No, just the long nozzle similar to the ones on caulking guns. Q – Will it work on a radiator leak in my car? Q – Can I use it to repair a crack on a plastic humidifier? A – Yes. Drain the water out and clear the surface then apply the liquid rubber and allow it to completely dry before adding water. 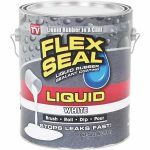 Q – Could I paint over the Flex Seal? A – No. You can’t be painted over. Q – What colors are offered in the Flex Shot? A – White and clear. 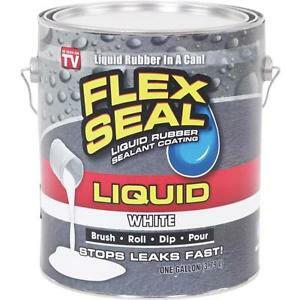 The larger products of Flex Seal come in black, white, and clear. 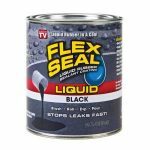 Many questions surrounding flex seal get answered in our convenient buyer’s guide section so that you don’t have to scour the web looking for answers to your questions. Amazon — It’s tough to find better prices than on Amazon. Many places that sell As-seen-on-Tv products should carry this rubber liquid. The places above are confirmed places of sale while their inventory last. Yes, it does. Clean the area of any debris and apply a thin layer and allow it to dry then add another two – three coats. Works great on concrete and adheres to everything. Dry time will depend on the temperature, humidity, and the thickness of the coating. The Rubber Spray will dry to the touch usually within 2 to 3-hours and in 24-hours for a full cure. It will also get much stronger over time. It will adhere to almost any surface such as porcelain, wood, metal, tile, concrete, masonry, fabric, glass, plastic, aluminum, drywall, vinyl, rubber, cement and just about any other wet (it works best on dry and clean surfaces even though it can be used on wet surface) or dry surface. It can handle normal rainwater and water pressure but anything intense it will not work against like fixing bike tires, the air pressure is too high. When using the aerosol spray make sure that you shake the can well then spray the liquid rubber into small holes, cracks, or fill in leaks with a distance of 14″ from your face. Apply thin layers at a time to allow the liquid to dry fully in between applications for ultimate results. Keep the aerosol spray in temperatures that are above 60°. Once you’re finished using the spray invert the can to get a quick burst so that the nozzle is clear. When using and storing the Gallon the rules still apply as they do to the aerosol spray such as keeping stored in rooms above 60° and not to use on high heat surfaces surpassing 350° and to apply thin layers to allow for better results. You can apply this liquid with a roller, brush or dip. 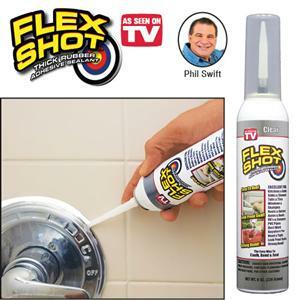 This is an amazing product for repairing cracks, leaks, and filling in holes and works great for a bathroom caulk. It will last for a long time to seal in moisture. Leaking gutters destroying your car rooftops can’t fight against this powerful liquid that dries into a rubber. There are so many ways to enjoy the product where others have failed such as auto restoration, fish ponds, and pool liners. Basements and foundations with the list continuing on. The only issues we see are that you can’t use it to repair tires because of the high pressure and you can’t use it on high-temperature surfaces that exceed 350°. The other thing is the terrible smell, but if something will save you thousands of dollars in repairs something that smells foul while it dries is alright in our book but do be sure to use this product in a ventilated area. Normally we detest products found on infomercials offering you the moon and the stars, but this time maybe there is some promise. We hope we helped you decide on whether or not this product is right for your next household projects and if there’s something you want us to add to this review about your individual experience, drop us a line.